Rooting an Android device is one of the reasons consumers buy the devices. It gives you Super access and privileges . Irrespective of you planning to tweak your Android system of optimize it, the feeling of having root access is powerful. While we do hope you are using the root access to the best and trying at least some of the custom ROMs and tweaks that we share with you for your lovely Android devices, there may be some bad patches too. If you are one of the unlucky ones getting those annoying Root Access Possibly Lost and Root access missing error messages, in this guide we will try to help you out. These error codes come up while you may be trying to backup, flash or restore a ROM in recovery, or doing some other little task. Let’s hope these tips help you fix missing or lost root access on Android! – Ensure that your Android device is properly rooted. As we always recommend you to, download Root Checker app from Play Store to confirm. 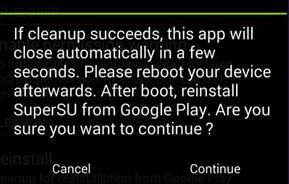 – In case you are getting the Root access missing message right after rooting your Android device, open SuperSU and update the binary if the app asks you to. – The root issue can also be specific to some particular app. If your root is working fine except for some specific apps, ensure to give those apps root permission from Settings > Applications > All > SuperSU. Clear app data and open the app to grant it permission when prompted to do so. – If none of the above solve your missing or lost root access error messages, try this: open SuperSU from your app drawer and go to app Settings. Disable and then enable it. Reboot your device and try using root apps. Let’s hope this fixes your missing or lost root access errors. – Open SuperSU > Settings and tap on Reinstall; select Continue. – If your rooted Android device has a custom recovery tool like CWM or TWRP, download the latest SuperSU from this link. Copy the zip to your Android device and flash it using the usual steps you do to install a custom ROM (Install option in TWRP and install zip from sdcard option in CWM). – Here is another fix to solve the “Root Access Possibly Lost” and “Root access missing” error codes in case your rooted Android device does not have a custom recovery installed. Extract the file contents and open the folder. Open a folder named common. Copy the Superuser.apk to your device and install it. Use the Root Checker app to see if the problem is solved. – If you have a Samsung Galaxy device with KNOX, the above solution can possibly help you too. When you have installed the Superuser.apk, open the app. When you see the following message: Samsung Knox has been detected. This might limit root capabilities and cause annoying popups. Try to disable KNOX. Select OK.
We hope that some of the tips shared above to solve Root Access Possibly Lost and Root access missing error messages. If none of these help you, try to root your Android device again and hopefully it will do.